Cooking on a coal range, anyone? I'm buying a house and one of the biggest thrills is it has a range! (Have been told by the present owner that it works, so we shall see). I'm itching to not only get to the point where I sign contracts etc. but to actually use it. Has anyone on here any experience in using a coal fired range like this? I think the first thing I'll try is making Yorkshire Puds in my grans old pudding tins.. and maybe a loaf of bread. At least with the one in the house I'm getting, you can cook on it as well. I've not seen any info on cooking on a coal range, so it would be interesting to hear of anyone else's experiences/memories. Re: Cooking on a coal range, anyone? In winter when it was lit for heating, Mum used to cook lots of stews and casseroles in hers and jacket spuds as well, and I can remember toasting bread on a long-handled fork. Kettle was always on the side and quick to boil for a cuppa! We had a gas cooker, as well, for summer and cake/bread and pie making as that gave more control of the temperature. I also remember that my 'pocket-money job' of black-leading it every Saturday morning, was not nice tbh. Next door was a large Irish family and theirs was even used to cook their 'winter festival' goose - must have been a squash with the spuds and every thing else, for all of them - but that was their only means of cooking. Have a look for 'The Glasgow cookery book' . I picked up an early edition for very little money , first printed in 1910 it was all range and open fire cookery at the time . There are more recent editions which have been 'updated', whether this has meant the loss of any range cooking tips and wrinkles i do not know. I’ll have a look for that, thanks. I’m guessing it’ll be similar to an Aga. My nan used to have a range just like the one in the top picture. There was a chenille cloth on the mantel above the range, with a fringe that hung down, and cast shadows on the ceiling when the gas mantles were lit. The best rice puddings ever came out of one of the ovens at the side, and there was a string mop head on the hearth where newly hatched chicks nestled if it was too cold to put them outside. Really cheap cuts of meat were turned into wonderful casseroles, and jacket potatoes were always on hand. 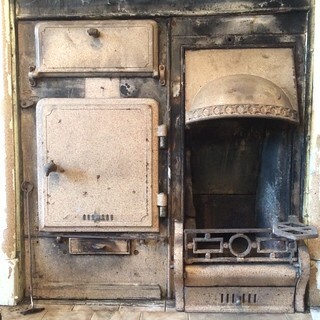 The flickering of the coals made the room feel really cosy, although the rest of the house was like a fridge. I can't think of anything that we use today that could possible give children such wonderful memories to look back on. I think in many ways we were the lucky generation. Just bought a 1920’s edition of The Galsgow Cookery Book off fleabay, was only a fiver so will see what it says. @jaydig those memories sound wonderful! 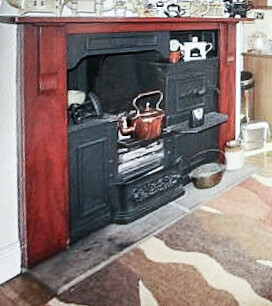 I used to love my grans coal fire and would go round on a Sunday morning to clean and make it. Wonderful memories - and what fun to try cooking on it! We wouldn't be without a woodburner or open fire (we're fine in power cuts!) but have never cooked on a range. An old old friend from Yorkshire remembered making jam on an open fire, running in from the harvest chores to stir it at intervals! Best ever machines ever designed! Heat, cooking, hot water, and a pleasure to sit by! We've lived in three houses with small Regent/No 1 Rayburns, and yes, they were the modern equivalent, but what marvellous contraptions! (Great for porridge, use a double saucepan)! In fact, because of all the above plus dodgy discs in my lower back, now I'll only be lighting my stove for special occasions (and perhaps if we got a really arctic winter!) and use the 'loadsa' money I would have spent on coal to have the central heating on for longer.